RT LTA Systems has announced the introduction of the SkyStar 120, a micro-tactical aerostat system designed to provide commanders in the field with real-time reconnaissance capability, even when operating in rough terrain. The system was recently demonstrated to the Israeli Defence Forces, and is ready for operational use. 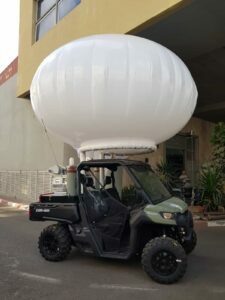 Based on the platform of the Skystar 110, the SkyStar 120 Ground Control Station is mounted on an ATV (All-Terrain Vehicle) that can drive through most kinds of terrain, allowing the operating force to keep moving and maneuvering with the aerostat on the ATV alongside them, either filled with helium and ready to be launched or already flying in the air. This allows the operating force to better fit the observation and communication lines in real time according to field conditions. Compact and robust, the SkyStar 120 is operational under extreme weather conditions and offers surveillance range of up to 1,500 feet.